When I registered for my CFA Level 1 and got the books designed by the CFA Institute I was overwhelmed with the course content. The level of detail the Curriculum goes through is just staggering. I thought I could never complete the course in time, let alone pass. Close to about a month before the actual exam a friend referred me to the videos presented by IFT. Although the videos seemed long at first, I was amazed how quickly I completed a chapter as compared to self-study. The best part? We never skipped a learning objective. I highly recommend these videos to anyone sitting for the exam, especially students who are working full-time. 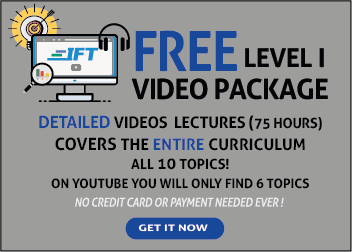 Time is a precious resource, and the IFT videos make the most of it! Level 1 Detailed Videos are now FREE!